Despite our improved standard of living, why are infections and disease so rampant? Why are our bodies not able to fight them effectively? The answers lie in our eating habits. The need today is to build up our immune systems. So then, what do we eat and how? It`s astonishing that despite having the solution in front of our eyes we choose to ignore it. Let`s not ignore the early signs of personal illness until it`s too late. Let`s go back to the basics to develop an eating format that will make our bodies stronger and more resistant to infections, allergies, and attacks. Consume two cups of curd everyday for four months in any form. A daily intake of this food prevents diarrhea and stomach disorders. Garlic helps fight bacteria, viruses, and even cancer. Consume greens daily. Go for all the greens you can and watch them work wonders on your immunity. A glass of carrot juice or a bowl of papaya or mangoes would be an ideal way to start your day and get your share of vitamin A.
Vitamin C is a good source of immunity. Most fresh fruits and raw vegetables are rich sources of this vitamin. Gooseberry, guava, capsicum, orange, and sweet lime are a few of them. Zinc can fight bacteria, viruses, and parasites, and common colds and respiratory tract infections. Wholegrain cereals like bajra, jowar, wheat bran, wheatgerm, peanuts, most lentils, pumpkin, watermelon seeds, and spinach are good sources. 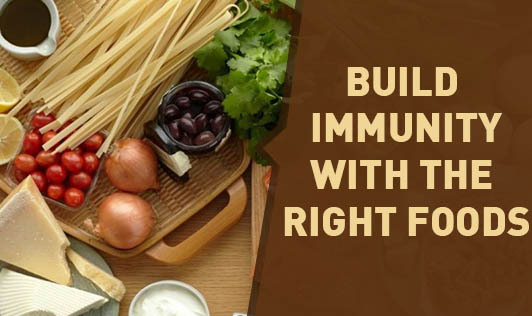 So eat right and step up your immunity.